Synopsis: Hundreds of years after civilization was destroyed by a cataclysmic event, a mysterious young woman, Hester Shaw (Hera Hilmar), emerges as the only one who can stop London"now a giant, predator city on wheels"from devouring everything in its path. Feral, and fiercely driven by the memory of her mother, Hester joins forces with Tom Natsworthy (Robert Sheehan), an outcast from London, along with Anna Fang (JIHAE), a dangerous outlaw with a bounty on her head. Universal Pictures and MRC present Mortal Engines, the startling, new epic adventure directed by Oscar®-winning visual-effects artist Christian Rivers (King Kong), based on the award-winning book series by Philip Reeve. Joining Rivers are the three-time Academy Award®-winning filmmakers of The Hobbit and The Lord of the Rings trilogies, Fran Walsh, Philippa Boyens and Peter Jackson, who have written the screenplay. It would take seven years for author and illustrator Philip Reeve to pen his first young-adult novel, Mortal Engines, which was first published by Scholastic in 2001. "The biggest idea I could think of was a city on wheels but then I had to ask, 'Why would you want a city on wheels?'" Reeve says. "It seemed arcane, but then I realized, you would want a city on wheels to chase a smaller city on wheels…and when I worked that out everything fell into place." The acclaimed novel, which earned the Guardian Children's Fiction Prize, the Los Angeles Times Book Award, the Smarties Gold Award and Blue Peter Book of the Year distinctions and was shortlisted for the prestigious Whitbread Award, would evolve into a series of four books known as The Mortal Engines Quartet: Mortal Engines, Predator's Gold, Infernal Devices and A Darkling Plain. Reeve's story takes place centuries after civilization was destroyed by a cataclysmic event known as the Sixty Minute War. Humankind has adapted and a new way of living has evolved. Gigantic moving cities now roam the Earth, ruthlessly preying upon smaller traction towns. Tom Natsworthy"who hails from a Lower Tier of the great traction city of London"finds himself fighting for his own survival after he encounters the dangerous fugitive Hester Shaw. Two opposites, whose paths should never have crossed, forge an unlikely alliance that is destined to change the course of the future. During his time at art college, Reeve had experimented with a Super 8 camera but decided it would be easier to illustrate and write novels than make movies. ("You don't have to give people lunch or dress them in costume," Reeve says, dryly.) Still, he had a clear vision of his story's cinematic future. "Mortal Engines always wanted to be a big action movie when it grew up," Reeve says. "It has a three-act structure and big set pieces. It was just itching to be filmed." Scholastic Media president and Mortal Engines' producer Deborah Forte agreed. "There is a little bit of an actor in Philip, and a little bit of a director, so when he writes it's in a very cinematic way," Forte says. "You know what the world is, how it looks and sounds and what it feels like to be there." And Forte, who had helped bring The Golden Compass to the big screen, immediately thought of the one filmmaker with the extraordinary vision and peerless sensibility to adapt Mortal Engines into a blockbuster movie experience: Peter Jackson. Jackson and his fellow filmmakers Fran Walsh and Philippa Boyens weren't exactly looking to make another world-building fantasy film when Forte first sent them the property around 2005. "There were a lot of projects coming at us after the Lord of the Rings films, and a lot of them were fantasy projects," Boyens says. "I got an email from Pete, asking me to take a read of this book. He didn't tell me too much about it, because he wanted my honest opinion. And from the very first sentence of the book I was hooked. I kept reading, hoping it was going to make me fall in love with the characters, hoping it would have an amazing ending, and it did, all along the way. So I wrote Pete back and said, 'Hell, yeah. This is an extraordinary story." From the start, Jackson was excited by the ideas and the imagery of Mortal Engines. "Society has rebuilt a semblance of what it used to be, except the cities are now actually moving," Jackson says. "They are huge traction cities. London is over a mile long, and they chase and hunt smaller cities across this landscape called the Great Hunting Ground, which is essentially Europe." Embedded in Reeve's depiction of the future is the concept of Municipal Darwinism. "In its simplest form, the bigger cities eat the smaller ones," Jackson says. "The smaller cities eat the smaller towns, and the smaller towns eat the tiny little towns. They see that as a very natural evolution. When we join this story this has been going on for over 1,000 years so it is very established." He pauses. "The trouble with Municipal Darwinism is that there is a limit to it. Eventually the big cities eat so many of the smaller cities that there are none left, so they have to either turn on each other or find something else to hunt." He loved the concept of cities on wheels devouring each other, and the tale's narrative and emotional elements of love, compassion, vengeance, and liberation. "You are always looking for stories with humanity," Jackson says. "Mortal Engines has that." Jackson's Wingnut Films optioned the property and then began pre-production on Mortal Engines in New Zealand in 2008, but the project needed to be placed on the back burner for several years while Jackson and his fellow filmmakers created The Hobbit trilogy. After the release of the final Hobbit film, Battle of the Five Armies, in 2014, Jackson decided to write and produce Mortal Engines, and he and Fran Walsh asked their longtime collaborator Christian Rivers to direct it. "I always wanted to produce something for Christian, and this was the perfect moment in time," Jackson says. Besides, he adds, laughing, "If Christian can direct Mortal Engines, at least I get to see the film!" Twenty five years earlier, Rivers had sent Jackson a fan letter and had enclosed drawings of dragons and a request for a job. Jackson was impressed and hired him. Rivers' first assignment was storyboarding Jackson's first feature, Bad Taste. They continued to work together, as both of their careers expanded. Rivers eventually won an Academy Award® for Best Achievement in Visual Effects for his work on 2005's King Kong, and Jackson knew Rivers had a gift for storytelling and was passionate about conveying complex emotion on screen. The offer from Jackson, Rivers says, "came along like a freight train." Fortunately, he was well prepared. Rivers had designed the pre-visual planning for the film years earlier and knew the project well. Still, the enormity of the project was not lost on him. "How the hell do you turn this into a movie?" Rivers thought at first. "How do you sell these giant cities moving? How do you make that process believable? In a book there is a lot of metaphor, but film has to be fully literal." Luckily, he and his fellow filmmakers had experience of translating fantastical literary worlds to film. "It's something we have had a lot of experience in," says producer Amanda Walker, who served as associate producer on The Hobbit trilogy. "We've taken material in the past that is very cinematic, something we have never seen before. Our artists thrive on responding to that material and rising to the challenge of delivering a world that no one has ever experienced." Even better, the Academy Award®-winning team of Fran Walsh, Philippa Boyens and Jackson had signed on to write the adaptation. "We know each other, trust each other," Boyens says. "And our collaboration is built on respect." From the beginning, Walsh, Boyens and Jackson understood that the script needed to explain the world of Mortal Engines to the audience without sacrificing the speed and agility of the narrative. "The secret is telling people how this world works without bogging down the whole story," Boyens says. They also knew that this massive new world needed to be anchored by a real, emotionally authentic, human story. "This world of Mortal Engines felt like a very fresh idea," Boyens says. "At the same time, the story itself pulled together all the surviving threads of humanity." That humanity is at the core of all the stories they tell on film. "There's no point in making a movie unless you've got characters that you can relate to," Jackson says. "I mean, why bother? 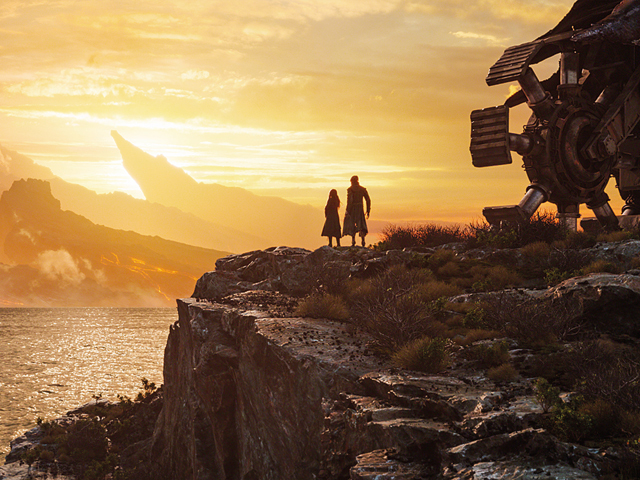 We may be projecting ahead about 1,700 years in Mortal Engines, but human beings are still human beings. If we went back two or three thousand years, we could sit down and have dinner with a person in Ancient Egypt or Rome, and we would probably still find a lot to laugh about and connect with, even though that person comes from a totally different world. The environment may change, the society may change, but humanity is always there. No matter how crazy or fantastical the world we create around them may be, we make sure that world is inhabited with characters that you can connect with." Most of the central characters in Mortal Engines are in their early 20s and the filmmakers decided early on to seek out actors for those roles that weren't already well known to most audiences. "When you have younger characters leading the story, those everyman and everywoman characters are better off if they are played by lesser-known faces," Jackson says. "So, we set the casting-net wide, searching the globe for young, fresh-faced actors who we felt could carry the complex human story that drives the film." In this future world, accents offer a crucial source of information about the characters. Nearly all of the 50 speaking roles required the actors to either modify or completely change their native accents. To oversee this process the filmmakers brought in England based dialect coach Jan Haydn Rowles (Game of Thrones). For the most part, the characters that live on London have British accents, although variations were used to indicate the tier in London that they were from. Essentially, the lower the tier the more common the accent. Rowles collaborated with each actor, helping fine-tune the accent to suit each individual role. The heroine, Hester Shaw, is "one of the most amazing modern characters ever written," Rivers says." Injured as a child during a fight that took her mother's life, Hester has been left with a facial scar ¬¬¬– a constant reminder of the brutal crime. It is also a catalyst for Hester's transformation into becoming the ultimate survivor and a woman propelled by the desire for vengeance. "What I love about Hester is that she's the answer to the mystery of the whole story in this film," Boyens says. "She just doesn't know it yet. Ultimately, she finds that she's actually part of an even greater mystery and a much more dangerous threat, not just to herself but to the entire world." After her mother's murder, Hester was found and raised by Shrike, a "resurrected man," who is half human and half machine. He kept her safe but he wasn't an ideal model for her emotional and social development. "Being raised by Shrike has led to a few personality issues for Hester," Jackson says. "She's compelling because she's a character who has a driving desire to assassinate somebody. Normally, those characters are the baddies in a film – they're the people you don't empathize with. The film takes you on a journey where you start to understand, right or wrong, why she wants to do it." The search for Hester was extensive, and global, and critical. The character is the emotional and narrative center of the film. Finding an actress who could convey that singular alchemy of strength and vulnerability, mystery and danger, righteous anger and wounded spirit, proved elusive until, an audition tape arrived from Icelandic actor Hera Hilmar, who had appeared in An Ordinary Man and Anna Karenina. "She was just perfect," Rivers says. "Relatively unknown, captivating, beautiful and fragile, and we knew we could put a scar on her." The audition tape was so strong, in fact, that the filmmakers, after a Skype call with Hilmar, cast her without meeting her in-person. "Hera reminds me of Ingrid Bergman," Boyens says. "A classic beauty and an old soul with a calmness about her"absolutely perfect for the role of Hester." The actress was thrilled for the chance to play such a complicated and fearless role. "Hester is such a cool, compelling character in every way," Hilmar says. "I love her fierceness and how unapologetic she is, but she is still looking for something, and missing something. Hester is an angry woman with a purpose, willing to lose everything to right the wrongs done to her loved ones." At the start of the film, Hester has been on her own in the barren wastelands for six months. Hilmar wanted to investigate and understand that sense of isolation. "I try to sit with a character as much as I can when I am prepping," Hilmar says. "I feel like I need to color in everything around me, in a 360-degree way. For Hester, I'd go to remote areas I found in New Zealand and try to imagine how it would be to have no one to rely on, living in the fierceness of wild inhabited nature, and how you would survive, both physically and mentally." Her accent in the film reflects the seclusion of her upbringing. Hester's mother in the film has an American accent, but Hester has been raised by Shrike, who is part machine. Dialect coach Rowles worked with Hilmar on an American accent but purposely didn't iron out all of the actress' native Icelandic influences. In the end, Rowles says, they landed on "something quite unique and perfect for Hester, who is an outsider to London." The character of Tom Natsworthy is, in many ways, Hester's opposite. Raised inside the traction city of London, he has no real sense of the world outside of it. "Tom is very sheltered," Jackson says. "He has never actually touched mud or grass; he has never set foot on stable ground. His whole life has been on the move on the decks of the city of London. He has been raised to believe that anything that is not a part of the traction world is to be feared and regarded as a threat to traction cities." Orphaned as a boy when his parents were killed in an accident, Tom was taken in by the Historian's Guild and is treading a typical path for a young man in London. "Tom represents a lot of people," Rivers says. "He has an okay life. He is well meaning, basically a cheeky lay-about. He believes in the system that is London." But Tom's world is soon turned upside down and his fundamental beliefs about London"and who within it can be trusted"are tested, when he meets Hester Shaw and finds himself on the run with her outside the protective fortress of the city. "His journey is falling out of London and having to survive with Hester on this stable unmoving world," Jackson says. "She is totally foreign to him and not somebody he warms to. They are an unlikely couple of people that have to survive in this unforgiving world." The filmmakers needed to find an actor who would bring "lightness and humor, and a whole lot of personality to the role," Rivers says. Tom needs to be accessible and relatable because he also serves as the audience's entree into this strange new world. "Tom is one of us, and we filter the story through Tom's eyes," Jackson says. They found all those qualities, and more, in Irish actor Robert Sheehan (Fortitude, Misfits). "Robbie is irrepressible and curious about everything. Perfect attributes for Tom," Boyens says. And the actor injected that same enthusiasm and positive energy into his preparation for the role. "He invested so much into the character that is not on the script page, and that is a dream for filmmakers," Jackson says. "You want an actor to come along and absolutely own that character and turn it into somebody who is captivating and funny and charming"much more than we could actually write." "At its heart this is a love story," Jackson says. "But it doesn't start out that way. It starts out as an assassin trying to kill somebody and a naive young man trying to stop the assassin. They don't trust each other for a long time." For Sheehan, the interplay between Tom and Hester, and the eventual deepening of their connection, was as important as the development of his individual character. "Tom and Hester are two people who endure great adversity and are chalk and cheese, but they are forced together and an inadvertent love story develops," Sheehan says. "Hera's and my job has been mapping that love story. People have to attach to the human beings as much as the excitement. This story has to be anchored in humanity." Striking the right balance for that love story was crucial. "Tom and Hester become two people who can trust each other and end up being soul mates," Rivers says. "Tom's love for Hester is a pleasant surprise and is not labored." Sheehan's admiration of his co-star was just as easy. "Hera plays Hester with such vulnerability," Sheehan says. "Hera has this great power, on- or off-camera. When she is talking to you, she has you in her 'Hera beam.' She is an incredibly engaging and charismatic person, and she brought a real savagery to Hester"like a feral warrior with a blade in her hand." Hilmar found working with Sheehan to be invigorating and always entertaining. "He's got a lot of energy he gives to people around him. We've been on a whole journey together, Robbie and I," Hilmar says, laughing. "From our first scenes together, where our characters were like, 'get out of my face," until getting to know the intimate details of each other's characters, we developed the relationship between them, whilst at the same time developing our own relationship as actors and getting to know each other better as people. Robbie has this drive and curiosity to life that lent well to Tom. No day is the same with Robbie on set!" For the role of the dashing Thaddeus Valentine, the team turned to an actor they knew exceedingly well: Hugo Weaving. Having played Elrond in The Lord of the Rings and The Hobbit trilogies, the Australian actor was more than happy to jump the ditch to New Zealand again. "I genuinely love coming to Wellington," Weaving says. "The people here are incredibly creative, resilient, easy-going and friendly. All of those things play really well into the making of this incredible creative beast that is film." Thaddeus Valentine is the city's lead archaeologist and is admired by his fellow Londoners for his daring expeditions and important discoveries. Valentine has risen from modest origins but he now lives in rarefied air, Rivers says, having been given "special privileges and special station by the Lord Mayor, due his popularity and his promise to create a better future for London." The character's profession also provides illuminating context in the future world of the film. Valentine is digging into the past, but his past is our present. "This is the Dark Ages of the future," Weaving says. "Technology and science have been lost; knowledge has been lost. Archaeologists are digging up old tech that became repurposed and refashioned and re-understood. They are rebuilding science and technology. Valentine has acquired quite a lot of fame for bringing a lot of these things back to light." But Valentine's research into the past has shaped his thinking about the future, and not always in altruistic ways. "Valentine is willing to do something immoral if it is for the greater good," Rivers says. "He sees Tractionism as a flawed system, and we almost buy into the way he sees things." He's also not quite who he presents himself to be and Weaving was intrigued by the duality of the role. "He's a romantic, heroic man that everyone knows, but he is also an outsider to London and feels like a loner," Weaving says. "He is an adventurer, very independent, highly intelligent and quick-witted. But he also has many complexities. Those, as well as his backstory, play out as the film progresses. We then get to see a much darker side of him." No one was better equipped to play both sides of the Valentine coin. "Hugo has a wonderful confidence about him, and he is someone that you absolutely trust," Jackson says. "Valentine has morals that are not straight and level, and Hugo brings this confident calmness to the character. Then he digs deep into the dark side in surprising ways." It also doesn't hurt, Sheehan adds, that Weaving "is a great, big cloud of charisma." The daughter of Thaddeus Valentine, Katherine Valentine is a privileged young woman from the top tier of London. She's warm and kind, but her life of high status has insulated her from some of life's harsher realities. To bring her to life, the filmmakers cast Australian actress Leila George, who was fresh out of the Lee Strasberg Theatre and Film Institute and is making her feature film debut with the role. "Katherine is full of life," George says. "She is excited about new things and likes to be liked. All she ever wants to do is help. She has had a sheltered life and is now going through the stage when she realizes her parent is actually a human being as well." Katherine's growing awareness is not just restricted to her father, either. "She starts to uncover that there are dirty truths to her world," Rivers says. "She senses there is something wrong and takes risks to go and uncover it. She believes it is unjust and seeks to change that." Katherine's awakening, though, threatens to unsettle her close relationship with her father. "When we first meet Valentine and Katherine, their relationship is one that many people would envy," Weaving says. "They have a good, strong reliance on each other. She is essentially brought up as a mirror image of himself." That bond begins to fray, however, when she begins to have doubts about his true motives, and his actions. "The truth is much more complex," Weaving says, "and she discovers entirely unpalatable things that he has done." That, says Boyens, proves central to of one of the film's primary themes. "Part of the heart of this story is about digging up the past, uncovering the truth, and that part of the story is carried by two of the main female characters, which I love," Boyens says. "With Katherine it's about an almost brutal realization that everything she thought was true was not. Very quickly, she has to make a decision about what she's going to do about it. She has been protected, and now she has to be brave." Around the time that Hester Shaw arrives in London, Katherine Valentine meets a low-ranking engineer named Bevis Pod. He does not trust her, at first. Bevis is curious, and earnest, and his observations have exposed him to the sinister side of Thaddeus Valentine. And his station in life means his voice is unlikely to be heard. "Bevis has been taught not to step out of line," Rivers says. "However, he is given a chance to assist Katherine and make a difference. He chooses to take risks in order to help change society for the better. Katherine and Bevis team together and give each other strength." Irish actor Ronan Raftery, known for his work in Fantastic Beasts and Where to Find Them and The Siege of Jadotville, was thrilled for the opportunity to portray Bevis. "Bevis is disillusioned with how the city works and suspicious of anyone from the upper tiers"the folk who run the city," Raftery says. "He has seen first-hand the dangerous lies that are being sold to Londoners and newcomers alike." So he's not exactly welcoming when Katherine shows up on his lower tier. "Katherine is from Tier One, so Bevis is very wary, almost hostile toward her when they meet," Raftery says. "She embodies the social inequality that Bevis hates, but he figures out quickly that she is more than some upper-tier snob. He loves that she is an incredibly strong woman. She is a girl who is completely in charge of her destiny and unafraid to take anyone on"no matter the consequences." She feels that connection too. "Katherine likes Bevis because he's the bad boy who is there for her," George says. "This is really the first time she has been excited about a boy, and it comes at a time when she is questioning her faith in her dad." It helped that Raftery and George bonded during three weeks of pre-production in New Zealand. "Working with Leila was a breeze," Raftery says. "She's so cool. She was always incredibly well prepared and totally fearless. You really have to up your game when you're in a scene with her." One of the most compelling characters in the Mortal Engines universe is the part-human, part-automata, Shrike. Hundreds of years old, Shrike is the last known "Stalker" roaming the Earth -- a dead man resurrected by technology. "They were built to kill," Jackson says. "Human bodies were taken off battlefields and turned into the most ruthless, powerful soldiers possible. So they've had a lot of their humanity removed. They've got human brains inside their metal skulls, but the compassion and consciousness has been taken out of their minds. You give them a task and they do it. Now, there are no more wars to fight and so our character of Shrike has become a bounty hunter." Standing approximately nine feet tall, he is robotic in appearance, but he is much more than that. "Shrike is interesting because he is a programmed robotic character on some level, but also as time has gone on, he is connecting with more and more bits of the human he was before he died," Hilmar says. "He is finding his humanity, which makes him a fascinating character." We see that humanity at first, ironically, in how Shrike relates to machines. "His hobby is restoring these old automata that he finds in various states of ruin," Jackson says. "He painstakingly restores them to get them working again and brings them back to life. That's an aspect of Shrike's personality that I found rather sad and touching, actually." Although Shrike would appear as a digital character on screen, the filmmakers knew that finding the perfect person to perform the role via performance-capture was crucial. "We wanted to make sure we got an actor that was going to invest in the role and emotion of the character," Rivers says. They found that actor in Stephen Lang, who had rocketed to global acclaim in Avatar, and dazzled the filmmakers with his terrifying but empathetic performance in the thriller, Don't Breathe. Lang was immediately captivated by the character from the moment he read the screenplay. "When I hit Shrike in the script my hair stood on end," Lang says. "I felt in my soul that this was a heartbreakingly beautiful character and a role that I was born to play. He elicits terror but there is also something terribly pitiable about him." Lang was intrigued by the contradictions within Shrike. "For a character who has been emptied out, he is really full. For a character who detests memory or has no use for it, he is completely obsessed. For a character who is absolutely heartless, he has got the biggest heart." Lang approached the role with full gusto. "Rule number one is to serve the performance," he says. "I have to make the leap of faith that I can embody the character. I'm the first line of defense for Shrike. If I'm not definitive about this role, then who will be?" To inform his performance, Lang took inspiration from birds of prey. "I looked at the patience that these birds have and also how they perch," he says "I wanted to adopt a physical position at rest for Shrike, which is not like the one for a human being. When he works, he is always perched. It's one of those ways to create a difference, a signature." Lang also studied the praying mantis and swans, but it was a YouTube clip of dancer Rudolf Nureyev in Swan Lake that helped lock in Shrike's physicality. "When Nureyev moves, his arms don't move, and that's not human," Lang says. "When we walk, we counterweight. Nureyev keeps his arms back, and he looks like a folded bird. It's incredibly graceful and there is also something slightly robotic, which is right in the wheelhouse of this character." Finding Shrike's voice presented its own set of challenges. "Every time Shrike speaks in the book it is in capital letters," Lang says. "His voice is described as being like fingers on a blackboard, which is fine in a book but not in a film." To assist Lang with producing and projecting the voice of Shrike on set, the sound department built what became affectionately known as the "Stalker Talker." This invention was essentially a microphone that amplified and distorted a vocal input and included an earpiece so that Lang could easily hear himself. But Lang didn't just let this device do the talking. He tasked himself with producing the most "Shrike-like" voice possible. "We had to transmogrify it into something you could listen to," Lang says. "It is pneumatic, electrical and has a machine-like quality." When young Hester's mother is killed, she is rescued and taken in by Shrike. It's a complex and unconventional relationship. For Shrike, Lang says, finding Hester is "no different to finding a shiny trinket. Shrike doesn't know why he has her, but she becomes part of a routine because even he has a need to do things in an orderly fashion. They become familiar in their coldness. The question is, to what extent does he dehumanize her and she humanize him?" Hilmar has a number of scenes with Lang and admits it took a while to get used to his performance-capture outfit. "He was basically wearing tight grey pajamas with markers and his name clearly written on the front: SHRIKE/SLANG," she says. "I think it's hard not seeing the comic side to that, but then you quickly forget about it when you get into the scenes. Stephen brought Shrike so beautifully to life and Shrike was all there, soulful without a soul, gray pajas or not. He perfectly became his essence, and the details of his shell didn't matter really. He's all there." Through Hester, she developed her perspective on their relationship. "I tried to understand Shrike by thinking of him as someone with severe difficulty relating to other people, someone who has a very different way of approaching things socially," she says. Lang has nothing but praise for his on-screen counterpart. "Hera has great strength and fortitude, and there is nothing conventional about her in any way," he says. "She also has sweetness and vulnerability and a sense of humor. She's got chops and was a pleasure to work with." One of the most colorful characters in Mortal Engines is the Anti-Tractionist aviatrix Anna Fang. An infamous resistance fighter with a price on her head, Fang built her own airship, the Jenny Haniver, and is renowned for her fearless pursuit of justice and her peerless combat skills. "As our film begins we regard Anna Fang as being absolutely the villain of the story," Jackson says. "But then we encounter her, and slowly we begin to realize that there is a humanity there, and a ruthless determination to fulfill what she believes in." Anna Fang is the leader of the Anti-Traction League, an organization who are "almost like terrorists, or at least that is the propaganda that is promoted through London," Jackson says. "They believe humanity shouldn't be racing around the countryside eating one another's cities, but that people should settle down and plant crops, living much like we do today. Their beliefs are not particularly bad, but they are tough and led by Anna Fang, who is someone not to be trifled with." For the role of Fang the filmmakers cast relative newcomer to acting Jihae. An accomplished rock musician, the South Korean-born talent grew up in America where she dabbled in martial arts. Undoubtedly, she was prepared for the role as heroine, whom she describes as "a badass, ruthless, fearless leader with a lot of compassion for the oppressed." Jihae, Jackson says, "has an elegance and a power that is exactly what Anna Fang needed to be. She's a fantastic actor and she's playing a character whose beliefs align with her own in some ways, so she's able to play it with a lot of conviction and a lot of authenticity." The Anti-Traction League has attracted a mix of passionate and courageous individuals from all over the planet. To fill these roles, the filmmakers cast a diverse group of performers. The six actors bonded as a team, spending time together. They developed their own character backstories and even devised a call-and- response "war cry." "We used it to get our blood and energy up," says British-Zimbabwean actor Regé-Jean Page (Roots, For the People), who portrays Captain Khora, one of the leading figures in the revolution against the traction cities. "We'd throw it at each other in the morning as a greeting, or before a scene when we are all there. It was like howling with a pack of wolves." Mortal Engines commenced principal photography on March 20, 2017, and was shot entirely in Wellington, New Zealand. The principal unit filmed for 86 days, and a smaller second unit shot for 61. Nearly 1,000 people worked on the film over the course of the shoot, 98 percent of them New Zealanders. In a traditional Māori ceremony known as a pōwhiri, the cast and crew were welcomed onto Stone Street Studios just prior to filming by local Iwi " including an impressive kapa haka group of young performers. "It was a powerful and moving ceremony," Hilmar says. "To be welcomed into the society in such a personal, intimate way as the pōwhiri is a privilege. It's said that it wards off evil spirits and unites the visitor and the host in friendship and peace. It evidently brings the work good luck." Once into the shoot, Rivers admitted that the only thing more challenging than a day of shooting was, well, the next day of shooting. Having directed a splinter unit on The Hobbit and second unit on Pete's Dragon"as well as his own short film Feeder"Rivers wasn't new to directing; still, his experience had mainly been in service to other directors. "The hardest thing about directing is to remember to trust your gut," Rivers says. "You can overthink things." However, he had a powerful ally in Jackson, who was never far away. "Peter is a wonderful brain to guide me, but he let me shape things myself," Rivers says. "He is an amazing filmmaker to have in your corner." Rivers, surrounded by a crew he had spent his whole career working with, thrived in the role, and he was quick to endear himself to the actors, who admired him for his talent as well as his personable nature. "Christian knows how to communicate and work with actors and all the crew," Hilmar says. "He takes chances, knows the importance of the character journey and ended up creating something bigger than life." Sheehan appreciated Rivers' great sensitivity for the actors and his commitment to their performances. "I would have thought he would have been focused on visual effects, but he juiced different beats out of different scenes," Sheehan says. "He works you to the bone until he is happy, but he is also very decisive and knows exactly what he wants." Cinematographer Simon Raby enjoyed the collaborative process Rivers encouraged. One of Raby's challenges was to work out how to use lighting to create a look that honors the emotional and psychological temperament of a scene"without it being obvious. "It's a case of creating shape without feeling where it comes from," Raby says. At the same time, a great deal of light was also needed on set to "capture the data to a degree that in post-production you can find everything in the black…and give full latitude to the 14 stops we have." Second Unit Director Glenn Boswell (X-Men Origins: Wolverine, The Matrix) also served as the stunt coordinator on Mortal Engines. The Australian Boswell had worked on The Hobbit trilogy, allowing him to have an easy shorthand with many of the New Zealand crew. "Kiwis are creative, innovative and able to think on their feet," Boswell says. "The speed and the way the Kiwis don't get flustered always impresses me. They keep calm, think clearly and come up with the solutions quickly." Any great epic adventure film has its fair share of fight sequences, and Mortal Engines is no exception. One between Weaving and Hilmar took three days to film. "It's physically and emotionally very demanding, but great fun," Hilmar says. She laughs. "I'd rather be all in, though. Any day." Page, who plays a member of the Anti-Traction League, was particularly excited about his stunt scenes. "Working with the stunt department was like all my Christmases at once," Page says. "It's like being at the best Disneyland ride ever, except you're not strapped in." World building is something of a calling card for filmmakers in New Zealand, most notably seen in the astounding Middle Earth universe created by Jackson and his team over the six films based on the J.R.R. Tolkien books. "They do what they do so well because they are incredibly focused," producer Deborah Forte says. "In Wellington, you are able to tune out a lot of the world and focus and set your priorities. They have been able to assemble a team of people who are like-minded great artists and craftspeople." In the book, the time period of the story in Mortal Engines is intentionally vague. For the film, however, the filmmakers decided to anchor the story in a more concrete timeline. In the film, the Sixty Minute War has taken place about 100 years in our future – circa 2118 – and the film is set approximately 1,600 years after that, around 3718. So much time has passed since the war that the context of the film is not post-apocalyptic but pre-revival. "The Earth is actually renewing itself," Boyens says. "After the dark centuries -- those six hundred years of turmoil where humanity almost became extinct -- the survivors became nomads. They motorized. This gave rise to the Traction Era." The idea of Tractionism – cities that can move their populations to where the resources are -- was born out of a paucity of resources on a decimated Earth. As cities became desperate for resources, a nomad warlord named Nikolas Quirke set about repairing and motorizing London, enabling it to roam what was once Europe, devouring smaller towns and cities and appropriating their metal, fuel, food and human labor force. "In this story, we're about a thousand years into that era," Boyens says. The Tractionism movement flourished, but has given rise to an opposing force, the Anti-Traction League, which advocates for static homelands that sustain their populations on the resources they develop. "Following the Sixty Minute War, there were survivors who chose not to take up the nomadic life," Boyens says. "These survivors tended to head up into the hills, in search of farmable land, and as the traction cities arose, these people were pushed further and further up into the mountains. One of the biggest and most successful of these settlements is Shan Guo which is in the East, sort of on the Asian Steppes, and it's protected by mountain ranges where the traction cities can't reach." This future Earth, Jackson says, is definitely not some dystopian world. "We have pushed past the dystopian thing, and now the world has a totally functional society that is different from ours," Jackson says. "We tried to create a society where everyone is content, but there is conflict between different forces." All these big ideas created unique challenges for the filmmakers. "We are bound by the rules of physics and how our planet would survive," says Rivers, who worked for months to create a cinematic world based on internal and consistent logic. "There are all sorts of unspoken technologies that have to exist in this world, and in that respect we are lucky it is set in the future," he says. "We spent a lot of time spit-balling the logistics." In this future Earth, digital technology has been destroyed and analog communication and transportation systems have replaced it. Massive cities are able to move smoothly and quickly over the rugged landscape and airships fueled with floating gases roam the skies. The world in Reeve's book has a Victorian steampunk aesthetic and initially, back in 2008 during the film's early development stages, the filmmakers pursued it, but when they returned to the project years later, post-Hobbit trilogy, they felt that steampunk had become too commonplace in popular culture, and so decided to evolve and broaden the scope of the design. This didn't mean, however, that Reeve's original ideas were off the table. "There is a beautiful whimsy to Philip Reeve's drawings and we liked the idea of using what he did as much as we could," says Concept Artist Nick Keller (Avatar, The Lovely Bones). "He has a strong visual impact on the film." Reeve was open to the design team's new innovations. "The world looks uncannily like what I imagined, and where it doesn't, it looks better," Reeve says. "It is extraordinary to look through the art department and see the walls plastered with these things that lived inside my head for such a long time." The concept-art room, the engine house for production designer Dan Hennah, was essentially an art gallery for the film. As cast and crew began to arrive in Wellington, their first stop was the concept-art room, where they could glimpse, in exquisite detail, the visual wonderland they were about to enter. "The concept art was so beautiful," Jihae says, "stunning and intricate." That intricacy and commitment to hyper-specific detail extended to the actual sets. "Detail is the most important thing," Hennah says. "Set decoration and prop detail is crucial when you are shooting in 8K. In film, you need to overplay that aspect…otherwise you won't see it in the cinema." In all, over 70 sets were ambitiously created for Mortal Engines. Some were wholly practical and complete, while others were smaller with sections that would be supported by green screen. No set was entirely digital, Rivers says, because he wanted to ensure that his cast always had "at least one piece of set that was practical, something that the actors could be tactile with and ground themselves to." The actors, even those who had worked with the filmmakers before, were dazzled by it all. "Without someone like Dan Hennah, this wouldn't be the film it became," Weaving says. "His art department took care of everything"from the smallest detail to the hugest sets." Hilmar was enchanted. "It's like you are in a doll's house," Hilmar says. "And all the details that you had wished were inside that house when you were a kid are actually present; you can truly play with them." The film opens in the Great Hunting Ground, which is a futuristic barren wasteland that geographically approximates Europe. Built through scaffolding, polystyrene, tons of dirt and crumbed rubber paint, the set was a large organic landscape with giant crevasses that reflected the tire tracks left behind by the destructive traction cities. The cities themselves are so huge, Hennah says, that walking in their tread marks feels like "being an ant in the tread marks of a truck." And because the massive traction cities break the Earth's surface with their force and weight, artifacts known as "old tech" often surface like litter. "If you go six feet below the surface, there is a layer of the 21st century"things like CDs, DVDs, plastic bags and packets of biscuits," Hennah says. An early favorite set among cast and crew was the small traction city known as Scuttlebutt. Analogized as a "mechanical lizard" or a "multifaceted insect," the Scuttlebutt may be found trawling the Great Hunting Ground. Keller describes the exterior of this town as a "legged crustacean." "It is camouflaged and covered with steel over the top," Keller says. "It also has burrowing legs that navigate the landscape by following tracks from other cities. It can burrow underground." The inspiration for the interior design came from the steampunk origins of the source material and the gorgeous, 360-degree set enthralled the cast. "The Scuttlebutt is sensational, fantastic," says Peter Rowley (I Am Evangeline), who portrays Mr. Orme Wreyland, one of the "owners" of the Scuttlebutt. "My mouth literally dropped when I saw it. There are pipes, steam and"when there is danger"it goes down on its belly like a flounder and covers itself with dirt." Orme's wife, Mrs. Wreyland, is played by Rowley's fellow New Zealander MEGAN EDWARDS (The Lord of the Rings: The Fellowship of the Ring). "Scuttlebutt is rather small compared with many of the traction cities," Edwards says. "It's the equivalent of a hamlet with long, twisty carriages and a sense of articulation. There are a series of cells, with a large sewage container at the bottom that Mrs. Wreyland makes tea from. The set has so much detail"an amazing kitchen, practical locks on cells, rivets, use of recycled material, as well as things like plastic over the top of lace, just layers and layers." According to conceptual art director RA Vincent (The Hobbit trilogy), the final touches made all the difference. "Environments need to be tailored to the specific characters," Vincent says. "The final narrative is in the dressing, which is done by the set-decoration crew; they add a layer you can't draw in concept art. This dressing makes it an inhabited space." Scuttlebutt is a small agile traction city, so it needed to look as if it was actually moving. The only way to realistically achieve that was to make it actually move, so the art department collaborated with the special-effects team, in particular supervisor Scott Harens (The Hobbit, Avatar), to do just that. The set was divided into sections that moved independently but could be synchronized to move together. It required a total of nine special-effects technicians to operate during filming. The main cabin cockpit moved through 360 degrees on a gimbal, while the living room moved through 180 degrees in a rolling motion. The tail moved side-to-side in a fishtail manner. Steam and lighting effects were added, and motion-control software drove a sophisticated start-up and running simulation in the main cockpit. One of the most iconic of Reeve's creations is the red airship called Jenny Haniver. This vessel was built by Anna Fang while she was enslaved on another traction city called Arkangel, in the period before the events depicted in the film. This airship features throughout the subsequent books of the Mortal Engines Quartet and is an essential character in the stories. To inform the craft's design, Keller drew on its backstory from the source material. Anna Fang actually built the airship, piece by piece, from old junk she stole as a slave. Although cobbled together from trash, the wood-detailed end product came together like a lovingly restored boat. The exterior of the ship looks a bit like a giant red moth or a kite. Under the large expansive wings sits the boat-like patch-worked cabin, which leads to an expansive, open-back deck. Inside at the front is a complex dashboard of dials and switches, which sit before a swivel seat with joystick controls, similar to a helicopter. The living space is compact, with a small kitchen and bedroom and the suggestion of a bathroom. The space is filled with personal items, trinkets, artwork, comfy soft furnishings and beautiful wood paneling. The look is organic, feminine and reflects Asian influences in lettering, furnishing and artwork. "The Jenny Haniver has a lot of sentimental meaning for Anna Fang," Jihae says. "Every little nook and cranny is installed and placed by her. It's her home. Her baby." Although the Jenny Haniver set was also mounted on a motion base, a great deal of the movement was achieved using relatively old-fashioned film techniques. The special-effects technicians were literally pulling strings to move lights and keys to create the feeling of motion on the set. Later on in the story and the shoot, as more movement was needed, the base moved in slow, looping movements. This allowed Rivers to increase the craft's intensity with more turbulence"and shudders and fans blasting toward the actors' faces. "There definitely were moments that were more challenging to be on set than others, especially when all this glass had been shattered on the Jenny and we had this nearly arctic freezing wind blowing at us from all angles, all day, from these industrial fans!" Hilmar says. "And you get colder and colder, not really wearing that warm clothing, not having slept properly for a while …," She laughs. "But it looks great and the Jenny is so beautiful and such a fun set to work on. One of my favourites for sure. The details of the interior design were so full of character and warmth. " The fantastical city of Airhaven, which floats anywhere between 5,000 and 10,000 feet high in the sky"suspended from enormous balloons filled with a helium-type gas"was one of the largest of the production sets. "Airhaven is a sort of Switzerland in the air," Boyens says. "It's primarily a place for the great aviators of the static settlements and the Anti-Tractionists, but it's also visited by scavenger-traders and the occasional airship from a predator city. No guns are allowed because gunfire could blow the whole place up. It's a meeting place, a trading place. It's a place for spies and secrets and a marketplace of rumors and whispers and information." Adds Hennah: "It's the Casablanca of the skies. There is a lot of trading going on, but also a significant amount of mistrust. There are little alcoves everywhere where people can hide." The Airhaven set filled K stage, the largest stage at Stone Street Studios, where much of the movie was filmed. The set was 70 meters long (the width of a rugby field) and suspended from the ceiling grid, as well as tethered to the floor for safety. For Hilmar, Airhaven captured the sense of mystery and magic that permeates the film. "It was like a whole town, and you were finding new things all the time," she says. "Then later it caught on fire for one scene, and there were orange lights and flames and bombs; it was amazing." To design Airhaven, the art department modelled the city in 3D, using a state-of-the-art program called HoloLens Holographic, a mixed-reality technology. "Augmented Reality is fantastic when it comes to visualizing totally impossible structures," Ra Vincent says. "The headsets gave artists an opportunity to experience their drawings and sets at full scale. Not everyone can navigate a 3D model, but everyone can wear glasses and navigate a hologram." The technology enabled the art department to build Airhaven digitally, then allowed artists to view the set through the glasses on the stage it would be built on. By actually seeing the set in the space, they were able to make tweaks and changes to the design before set plans were drawn up. The massive set was a complex maze of gangways, bridges, ropes, wires and billowy parachute-like fabric. Lanterns and lights hung throughout. "It's a city with full-on gangplanks!" Sheehan says. "Just bonkers." The designers theorized that Airhaven had been constructed from pieces of airships. "Perhaps it was initially purpose-built but over time it has become quite organic," Keller says. For example, the docking struts have, according to the concept artist, "jellyfish-like tendrils where ships can come and hook on." Airhaven proved especially challenging for the special-effects department. "Wind was a big factor," says effects supervisor Harens. "From memory, we had a total of 10 wind machines on the studio floor, as well as air movers. For the later scenes, we filled the studio with a haze effect that was safe to breathe, and introduced blasts of CO2 to help sell the explosions"which we designed with air mortars, lighting and flash bulbs. We also rigged parts of the gantry to breakaway as stunts took place, with technicians dropping debris and ash from the studio grid. It was rather chaotic, which hopefully shows in the end product." The exterior of Strole, Shrike's home, looks like "a very hard beetle or a war tank," actor Lang says. The exterior has a rusty, metal surface and the design is quite skeletal. The structure is propelled by spokes with feet rather than by smooth wheels. Constructed by Shrike, Strole is basically a mobile workshop. Inside is a "gothic world, slightly dark, with shapes that you associate with church architecture," Hennah says. Because Shrike doesn't sleep, the room's main feature is a workbench. The workroom is filled with tools, spare parts, creepy automata and antique dolls and toys. The team designed Strole to be comfortable enough that it was credible that an eight-year old could live there without going crazy. Over time, Hester begins adding feminine touches for color, light and comfort. "Visually, there is a turning point and the hard killer is slightly exposed as having a softer side," Hennah says. Hester changes Shrike as much as he changes her, and that relationship dynamic is reflected in the set. "She adds some feminine and human energy to the place," Hilmar says. "He's filled it with dead things but she adds her little living touches, like wild flowers that she's somehow managed to find." London is the largest traction city in the film. Approximately one and a half kilometers wide, two and a half kilometers long and nearly a kilometre high the new London is divided into seven tiers. The bottom tier, or the gut, is where captured towns are ingested, the city is powered from, and waste is processed and disposed of. As one moves upward, life becomes brighter, lighter and more palatable"ascending to reach the top tiers where the upper-class Londoners live. This is where the seat of power is and where you find the most iconic historic buildings, including Old St. Paul's Cathedral. "We are familiar with different parts of London," Keller says. "But there is also something new and unfamiliar here." Concept designer Vincent reflects upon the irony in how the city functions: "London is a predator city, but the bottom tier is just there to support the top. They are in a way eating themselves up. It's quite cannibalistic." For Vincent, the London streets set was a great opportunity to experience just how massive London is. "We had an opportunity to build a substantial set with an almost 360-degree perspective," he says. "You feel like you are part of a bigger, larger entity and it helped me understand the scale of the actual world we are in." When conceiving the design of the city, Rivers decided that a good place to start was to determine what would survive a nuclear disaster 100 years from now. "This is a place where the glass is gone but stone statues have survived," Rivers says. "We decided to make anything we see in our world today archaeological, and then skew and twist things from there." It's a city where the citizens are aware of the past. "The people of this world have acknowledged that there was an advanced civilization that destroyed itself and they have built back up upon that," Keller says. "It's a new civilization built from the ashes." Old St. Paul's Cathedral, which sits atop of London, has been rebuilt using what survived the Sixty Minute War. The parts that were destroyed have now been replaced with blue steel. "It is the familiar presented in a very unfamiliar way," actor Page says. We recognize buildings on top of a city that is moving at 100 miles an hour. It is massive"bigger than the biggest battleship. Until you see, it is hard to imagine." Lighting also played an important role when it came to depicting the different tiers of London. Cinematographer Raby employed an industrial-green hue in the gut tier, then changed to images that are cozier and warmer in the middle tiers. Up on tier two, the lighting was fun and bright, radiating a pop-manic, post-Beatles, 1960s London. On the top tier, a more royal blue was used, signifying royalty or high office. The London Museum provides context to the history of London. "It's breath-taking," says Colin Salmon (Tomorrow Never Dies), who plays Chudleigh Pomeroy, the curator of the London Museum and senior member of the History Guild. "It has the feeling of a real museum and is an extraordinary place to be." Three adjoining halls were built for the museum set"complete with high ceilings and walls that look as if they're made of stone. Inside the atrium are large ancient Greek sculptures juxtaposed, amusingly, beside artifacts of 21st century movie characters -- a clue that we are now in a future world looking at back at our own present. In the Ancient Technology room, glass display cases showcase ancient tech such as computers, virtual-reality glasses, handheld games, earphones, wristwatches and a large collection of frozen and petrified mobile phones. "They are a precautionary tale about how people today are so attached to phones," Salmon says. "They look so authentic: scorched, petrified, fossilized. The detail is extraordinary." Beyond this exhibit is a library filled with books: now a rare and precious commodity. The costume department faced similar challenges and creative opportunities in reimagining this future world. "We took clothes that are recognizable to our world today and added a twist," producer Amanda Walker says. "The clothes are familiar, but the costume department then took them in a different direction, which made for a really creative palette." Lead by Bob Buck, the costume department, at its busiest, employed up to 110 crew members. One of the biggest decisions the team had to make was what place fashion would hold in this time and place. They also had to consider what materials and notions would be available in this resource-depleted future. "We created fabrics by manufacturing, distressing, laminating, painting, rubberizing and plastic-izing," Buck says. The limited materials available to the characters proved a creative boost. "A lot of time we were just doing the wrong things to a textile," Buck says. "There is a lot of leather, tweeds and checks, but not many buttons or zippers." London, Buck says, is as a bit of a pirate ship. In the lower tiers, the clothing is quite literally scavenged and cobbled together out of scraps. It's functional rather than fashionable. The department did a lot of scavenging themselves. "For the gut, we purchased second-hand clothing, pulled it apart and put it back together wrong," Buck says. "If you look closely, you will see there are puffer jackets stuck on the back of overalls, etc." Breaking down textiles was an extremely important part of the process, and Buck had a team that focused exclusively on this. "During production, we might have had 24 hours to make something look decades old," he says. "We'd try sanding, burning with a blowtorch, fine-dry brushing and then all sorts of muddying and dirtying. Every detail counts when you are breaking down. You might not always see it on-camera, but just ripping a stocking makes someone feel more bedraggled and in-character." In the upper tiers, there is a sense of high fashion and the clothing is eclectic, vibrant and colorful. "As you go up further, things become more structural," Buck says. "The upper-tier clothing reflects Carnaby Street in the swinging '60s. From there we pushed the envelope and the film started generating its own aesthetic." Buck paid special attention to how Reeve described color in the book. The clothing in the lower tiers is mostly in browns and greens, oily and dirty. The colors get brighter and cleaner as you travel up through the tiers. The costumer was very conscious of each decision. "Color has so many inherent emotions and information," Buck says. "There are so many symbols that we associate with colors, you have to be careful how to use them." Because the majority of the story takes place over just four days, most of the cast had one main look…with slight variations. Hester's outfit looks as though she has pulled it together using abandoned items of clothing and fabrics that have been reused and repurposed. She has distressed textured pants with a loose tank top, a long green coat and an iconic red scarf, a detail imagined by Reeve. In Mortal Engines, London practices a system of government where council seats are assigned to guilds"three of which feature prominently in the film: The Engineers who run the engines and operating systems are the most powerful, then the Navigators, and the Historians. Each guild member wears a recognizable uniform with variations that indicate his or her level of seniority. Reeve described The Engineers as a cult, so for them, Buck created an androgynous "clinical science-fiction look with a silver color palette," he says. Tom, by contrast, is an apprentice in the museum and a lower-ranked Historian. The historians wear blue tailcoats, and Tom's is a little ill-fitting. Likely, it's second-hand, indicating his lower status. Weaving describes Valentine's look as one with "understated elegance and authority." Inspired in part by Caspar David Friedrich's oil painting The Wanderer, the finery worn by Valentine has a romantic regency suited to his reputation as the chief archaeologist. For the majority of the film, he wears a long, green, wool coat, a waistcoat over his shirt and long black boots. When he is flying in his airship, The 13th Floor Elevator, he switches out his coat for a leather, high-collared flying jacket"and adds a scar for bit of flair befitting a captain. Because Katherine Valentine is also from the top tier, her costumes reflect her high status in London. George loved the collaborative process of working with Buck on her costumes. In fact as a part of her preparation for the role, George took sewing classes"a hobby she speculated her character might be interested in. "Katherine starts out really shiny, like a peacock," George says. "She is wearing a cute little '70s dress and velvet thigh-high boots. Then she puts on leather pants and coat, which is more of an espionage, dark-colored look." The look for Tier One was structured and extraordinarily colorful. Purple, pink, yellow, orange and turquoise were used generously. Ladies wear mini-dresses, skirt suits, tights, belts, gloves and handbags. Many gentlemen are clothed in color-blocked, structured suits with polo necks or neckties and sunglasses. Textiles are shiny, checked, striped, quilted and plastic-y. The result is a retro look with a futuristic, exaggerated, flamboyant spin. London's Yeoman Warders, the Beefeaters, are historically the protectors of the crown jewels and prisoners of the Tower of London. Their uniforms are ceremonial, almost comical, in bright red with gold-and-black stripes and a black hat with ribbon detail. In Mortal Engines, the Beefeaters are more like a secret police of bullies, but their look is a clear reference to the traditional uniform. Their costumes are a twisted, more sinister take on today's ceremonious look. Just below their hard black bowler hats, they wear heavy, dark-red-leather coats with a stripe detail that crosses at the back"reminiscent of the markings of a poisonous spider. Makeup and hair designer Nancy Vincent had a full team working on very structured elaborate hairdos for the Tier-One extras. "London can travel over 100 kilometers per hour, but the hairdos have to be bulletproof," Vincent says. They had to be sprayed into place like concrete." To add to the work, hairstyles for the women were gigantic, exaggerated, very sculptural up-dos, depicting strong shapes and designs. The men were well groomed with neat and tidy facial hair or were clean shaven. For The Engineers, Vincent complemented the androgynous costumes with hair styles that included "shaved sides with a longer piece on top and a half moon at the back for the men," she says. "Females had blunt, short bobs. They all had sprayed grey hair." For Hester, discussions of her facial scar started early in the process, with prosthetics designer Gino Acevedo (The Hobbit, King Kong) working through various scenarios using a 3D digital sculpting tool called Zbrush. Once Hilmar was cast, the process evolved using a cast of her head. Collaborative as always, the filmmakers were open to incorporating Hilmar's thoughts about the scar. "I wanted Hester to be as deformed as possible," Hilmar says. "I didn't want her scar to be pretty." Still, the scar had to be prominent without being grotesque. "It is different showing something on a big screen than describing it in a book, and the audience experiences it slightly differently," Hilmar says. "The most important thing was that it represented what Hester has been through and how she is carrying that with her every day of her life." When asked to describe the world of Mortal Engines, visual effects supervisor Kevin Andrew Smith uses one word: "big." The scale and creativity needed to move massive cities presented Weta Digital with one of its most epic challenges to date. At 860 meters tall, 1.5 kilometers wide and 2.5 km long, London is the largest of the traction cities in Mortal Engines. Typically, cities are imagined as static environments, constructed as if they are large practical film sets. Camera positions can be established and the action can be directed in such a way that the audience feels they are in a live physical space. The layout department usually handles the task of bringing together assets from the models department, as well as cameras and building a virtual set. In this film, the cities move at great speeds, so all of the regular rules and workflows went out the window. Early on, Weta established a new pipeline, one that combined a traditional environment-build with something more closely resembling their pipeline for digital characters. The essential component was to give animators the flexibility to add bespoke movement to the different pieces"as well as large segments of the city"to capture the flex and sway visible in rigid objects as they moved. The closest model they had for this hybrid was a hero vehicle, but the existing tools offered nowhere near the level of control and variance required for this job. Never to be outsmarted, they simply built new ones. New technology is par for the course at Weta Digital. "The pace of technological advancements at Weta is relentless," Smith says. "There are constantly hundreds of tiny little new things and improvements. Even films with a high degree of continuity, like the Planet of the Apes films or The Hobbit trilogy, see things change and evolve so quickly. The cutting-edge tools you build for the first film are starting to grow obsolete by the third!" In Mortal Engines London is constantly in motion, either looking for, or hunting down prey. To create a sense of movement within the city itself, the layout department assembled 113 hand-crafted sections of London, which they called lily pads. Each lily pad had an independently rigged animation setup that could be animated independently. This step was critical given the sheer size of the asset. Even with the power of high-end workstations, the team were dealing with hundreds of millions of component pieces, ones that the software had to keep track of and be able to move at the click of a button. The independence of the lily pads also meant that the city took on a rattling, shaking, vibration that simulated the kind of motion you might expect from a huge vehicle on the move. The illusion of motion was also addressed in the lighting and rendering of the shots. What often goes unnoticed is that, in part, your brain perceives distance and motion through the act of focusing your eyes. To communicate the sense of movement through space, artists used techniques such as the careful application of motion-blur and the adding of thin, misty clouds to the air in and around the city"visual cues that are familiar in real life. In an undertaking this large and without real-world precedent, it can be easy to lose your bearings. Weta Digital has a strong bias toward trying to replicate the real world so their works is always grounded in real-world physics. Unfortunately, when dealing with giant moving cities, physics and cinema do not comfortably align. In order to frame a shot so that the audience understands the action, the camera often needs to be in a place and at a distance that is not ideal for filmmaking. "Just having a scene of two traction cities moving across a vast landscape at 100 kilometers an hour looks like a couple of snails racing," says animation supervisor Dennis Yoo. "And no one wants to watch that on a big screen!" So they had to make London move faster than it realistically would. That, however, presented a new problem. "If you make it move too fast, it starts looking small," says visual effects supervisor Ken McGaugh. "It's a constant struggle between 'exciting' and 'real.' The challenge was trying to make something appear big on a massive, landmark-free landscape and not have it look like a remote control car on a dirt yard." What they discovered is that it wasn't viable to assign a specific speed to a traction city, but that the speed had to be variable depending on the shot. This worked well for the animators, but not so well for the FX team responsible for simulating natural phenomena. "Sometimes we were breaking the speed barrier and the effects team were pulling their hair out…saying, 'You can't do that! Our effects are breaking!'" Yoo says, laughing. The amount of dust that would be kicked up at Mach 2"or the amount of sway that you would see in masonry swerving at such a clip"would destroy the city or fill the entire frame with dust. Centuries after the Sixty Minute War, the land has been considerably flattened and is stark and barren. The relentless ploughing of the traction cities over the landscape has driven layers and layers of mud, debris and waste into the Earth. Weta re-created this effect by starting with a precisely coupled, fluid simulation with multiple viscosities; this could accurately simulate the combination of solid and liquid layers of the mud. They then began laying tracks and eroding them, and laying more tracks and eroding them"a digital mimicry of the geological evolution of a real landscape. Another challenge was to create an environment large enough to host all the action. "You have to build a world big enough to hold London and the shield wall, which is a giant wall that protects the static cities in the Himalayan Mountains from the traction cities," Smith says. "It's an unimaginable amount of stuff. You need both the volume and variety to make the audience believe this is a real place that has evolved into its form over time." The shield wall stands 1,800 meters high and is nestled between sets of mountains. When one considers that the Himalayas are 8,800 meters high, it's logical to appreciate the scale of this man-made barrier protecting Shan Guo, the central nation-state of the Anti-Traction League. Smith estimates that his team created around 50,000 square kilometers of landscape that sits in front of the shield wall, while beyond the wall is another 20,000 square kilometers of Shan Gou. When building these vast landscapes, visual-effects artists kept in mind the unconscious catalogue that audiences already have in their minds. "A mountain still needs to look like a mountain, but you also have the make sure you don't lose the human scale," Smith says. "You don't have to be married to physical rules but if you start there you will always find yourself in a more grounded place. Audiences bring a number of assumptions with them when a film is set on Earth, even if it is in the distant future. You can't throw the physics completely out of the window…but you can certainly cheat." When it comes to inventing something not previously imagined, such as the lethal super-weapon known as the Medusa, which has the ability to destroy an entire city, the effects team had a little more creative license. But not too much. "It is how a weapon like Medusa reacts with the real world where you have to be diligent," Smith says. "If something is exploding, we know how rocks fly through the air and how dust moves"so all of a sudden you are back to the physics book." Mortal Engines has one entirely digital character in Shrike. The nine-foot tall resurrected soldier is robotic in appearance, but possesses a human soul. A combination of human and high-tech mechanical parts, his character was designed to accommodate how these materials would integrate with one another to create one fearsome warrior. Actor Lang lent his performance to Shrike during the live-action shoot and embodied the spirit and essence of the character. Yoo worked closely with Lang's on-set performance. "I was always trying to put aspects of Stephen into Shrike," Yoo says. "The face kind of looks like Stephen." The animation supervisor pauses. "Well, if you can think of a zombified version of him and a robot." A hybrid facial-design concept was worked up for Shrike, combining metal parts with human skin to create a leathery, mummified face. This design saw Weta Digital develop a custom facial-muscle rig to portray the realistic tug and stretch of skin against metal. The animators created a digital model that could utilize the muscles and skin that were visible and still convey emotional beats. As Shrike's emotional arc develops over the course of the film, certain movements were softened where necessary. Additionally, his eyes were given a more subtle glow to help imply inner dialogue. Even the way in which Shrike moves differs at various stages in the film. Toward the end of the film, he is more damaged and broken, so he moves quite robotically and heavily. A lot of weight was put into his mechanical parts, and vibrations were added to make him look like a robotic man falling apart. However, when we first meet Shrike, Rivers wanted him to move more like a ninja. To accomplish, Shrike's motion was animated to be smoother and more calculated. The director's desire for bespoke character motion -- different from how a human would move -- meant animators didn't use motion-capture as a basis for his movements. "Christian wanted to push that boundary, where it doesn't feel like a man in a suit," Yoo says. "Shrike actually feels like something quite different." For composer Tom Holkenborg (Deadpool, 2018's Tomb Raider), it was clear from the start that London would need its own very distinctive musical theme. "I think of London as noble with a lot of history," Holkenborg, aka Junkie XL, says. "And then there is hooliganism." To bring out the personality of the massive city, Holkenborg wanted a lot of brass in the score. The New Zealand Symphony Orchestra, which recorded parts of the score in Wellington, called in all available brass players to fill seats in the "brass-only sessions." Instead of the usual five horns, there were 12, as well as nine trombones including a contrabass trombone. There were also strings and woodwind sessions that would be recorded separately. "There are not enough string players in the world that you could put into that same room with the brass, and the strings would still be heard," he says. It was Holkenborg's fresh approach and dynamic scoring that caught the attention of the Mortal Engine's team. In addition to the orchestra, he incorporated percussion, synthesizers, bass guitars, harps, choral sessions"and anything else that inspired him, into the score, including bashing a trash can and blowing through tubes. "Tom's score is absolutely incredible," Jackson says. "Having listened to a lot of Tom's scores, I think it's possibly the best score of his career so far. I really do feel that. He did a session where he was recording sounds in this big, old empty fuel tank, and it has this nutty, crazy reverb and echo. He's in there bashing away at things and creating these unworldly sounds and then he's able to turn those sounds into a music of sorts." as well as the future. He's created a unique sound world for this particular film." Holkenborg says that he saw the film, musically, in multiple colors. "Some films only need one or two colors, but this movie needed a lot more," he says. He started work on the film with very broad strokes. Going with a hunch, he started work at his home studio in California"patching up sounds on his wall of sound. This process produced elaborate suites in an effort to nail each character. "I'd then send that out to the filmmakers and ask whether they recognize their movie." When it came to character themes, Holkenborg was just as keen to distinguish our heroes and villains. "Hester was a revolving three or four notes that could be played to a different tempo," Holkenborg says. "She's a girl that's obviously damaged, but she is strident, and underneath there is a pure diamond. She is loyal and feisty, and it was important that the music reflected that"especially in the moments when it gets emotional. The arrangement of the music needed to have an organic quality to it that allows us, as an audience, to lean in." Valentine's theme, by contrast, had to come from the DNA of London and connect to the Medusa weapon. "Valentine's theme is very brassy in nature and heavy on the strings; very dark," says Holkenborg. "Valentine is completely connected to the weapon. His theme moves into the weapon's theme." When approaching the Medusa, which Holkenborg refers to as "she," he was inspired by Jackson's suggestion that Holkenborg reflect on how the weapon "thinks about herself." "Medusa is the most powerful atomic weapon ever built and you have to score her how she thinks about being that," Holkenborg says. "It's almost god-like." For these dark and dangerous themes, Holkenborg used a lower register for Valentine and moved to the higher part of the frequencies for Medusa. "We have soprano playing or singing that theme with the choir underneath to give it that god-like quality," he says. "The soprano underscores the arrogance." Sound designer Dave Whitehead (Blade Runner 2049, Arrival) loved the unique challenge that the Mortal Engines world offered to his team. As a rule, he tries not to use stock sounds on any film; rather, he prefers to start fresh and build a new library of sounds for each project. "The whole point of getting into sound is that you love the gathering and piecing together," Whitehead says. "You are painting…putting together a puzzle and you don't want to use broken, old pieces. You want to go out and tailor something just like you tailor a suit for someone." His team hit the road"recording everything from steam trains, miniature jets, and Tesla coils to capture unusual sounds for this extraordinary world. The sound team worked on developing a unique voice for each traction town and airship. "The key thing for the airships was to make sure we were creating a lot of contrast between them," says supervising sound editor Brent Burge (Ready Player One, The Hobbit trilogy). "No matter what you are seeing on the screen, or perceive to be in the background, you know exactly what they sound like." Shrike, too, has his own singular sound, that combines man and machine. "Christian wanted to have this heartbeat for Shrike," Whitehead says. "He wanted it to be this never-ending engine." To accomplish this, the sound editor recorded a series of different heartbeat sounds, ranging from a tiny metal drum to a bit of clockwork. In the end, about 20 components were brought together to make one heartbeat. Whitehead then "world-ized" the heartbeat, which involved playing the elements across a metal object"through a small resonating speaker into a real space. When it came to producing sounds for Shrike's feet, Whitehead grabbed a couple of metal wine racks and an old metal mic stand from home. He then bashed them on metal grating, then on concrete. The result, a terrifying unstoppable sound matched the unholy force of nature that is Shrike.